Yahoo (YAHOF) and ABC News are expanding a web traffic-sharing arrangement that dates back to 2011. The deal now involves the network news division's parent company, the Disney/ABC Television Group, according to a joint announcement on Thursday morning. One of the perks for ABC: its entertainment programming will now be promoted on Yahoo's site. 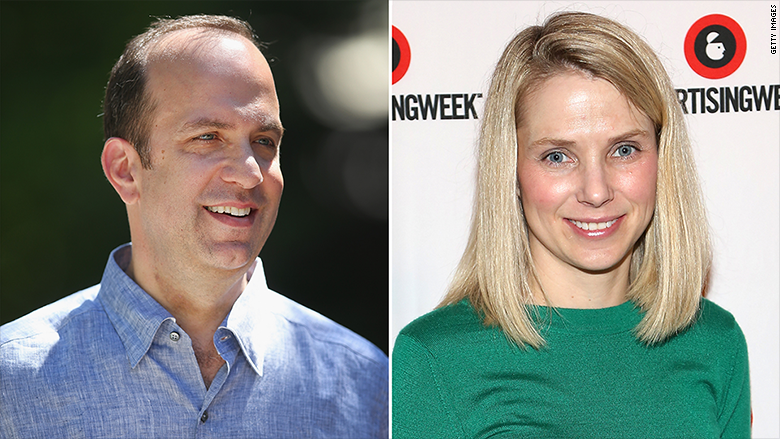 One of the perks for Yahoo: the heads of its new "digital magazines" will get air time on ABC's top-rated "Good Morning America." There was an example of the new synergy on Thursday's morning show when two stars of ABC's prime time drama "Scandal" interviewed each other. It was billed as an "ABC/Yahoo! exclusive," and viewers were directed to a longer version of the interview on Yahoo's site. According to the two companies, more such behind-the-scenes material from ABC shows will be streamed by Yahoo. This is valuable for ABC because Yahoo has a giant fire-hose of web traffic. Yahoo will also "feature ABC News content more often across the Yahoo network," the companies said, helping the news division reach "a substantially greater audience." That was one of the original intents of the 2011 deal, called a "strategic alliance" at the time. It gave ABC's news division more online visibility. On ABC's side, the players haven't changed: the 2011 deal was struck by ABC News president Ben Sherwood, and Sherwood is now the president of the entire television group. But on Yahoo's side, Marissa Mayer inherited the ABC arrangement when she took over Yahoo in 2012. She is now trying to mount a turnaround of the Internet giant, partly by creating and rejuvenating sections of the site covering style, health, food, and technology. As the original ABC deal was approaching its expiration date, Yahoo talked with other potential partners, including ABC's main rival, NBC. But the two companies wound up wanting to renew. Terms were not disclosed on Thursday. But one of the most significant additions seems to be "Yahoo Your Day," a daily segment on "Good Morning America." It will showcase Mayer's new sections and their top editors, like Joe Zee of Yahoo Style and Bobbi Brown of Yahoo Beauty. The morning show will incorporate Yahoo-owned sites in other ways too -- for instance, "Flickr images will be integrated into Good Morning America's weather reports," the companies said. And ABC will continue to pick up some of Yahoo's material. Last December, Yahoo's Katie Couric scored an exclusive interview with Stephen Collins, the actor accused of child molestation. Couric's interview appeared on both Yahoo's home page and ABC's television newscasts. Couric's deal with Yahoo, however, does not preclude her from considering other possible television jobs.